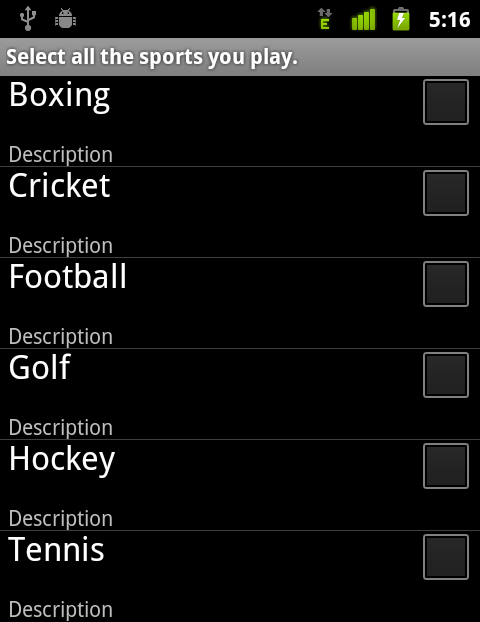 Listview is a commonly used UI element in Android application design. ListView allows users to select one or more items on the list. However ListView allows you to select one item or multiple items but not both simultaneously. So if the application needs an interface similar to GMail app implementation you are out of luck with the default implementation. That brings us to the point of this writeup, to implement a UI widget which responds to single selection as well as multiple selection. and will look like as bellow. the listeners handle the event accordingly. As all custom view implementations we will extend View. will compute where each component will be drawn. As the method name suggest, onDraw, we draw the view and onTouchEvent we determine how to respond. onMeasure method is called to get the measurements for this view, so this method gives us the chance to calculate the dimensions needed. Measure mode MeasureSpec.EXACTLY or MeasureSpec.AT_MOST gives us hints on how much width or height is available to work with. Code would be as below. onLayout is called next, the inputs contains the absolute position of our view. This is good opportunity to calculate the coordinates of our controls. These coordinates will be used to eventually during onDraw method. Next method to the called is onDraw. We draw the first line followed by the checkbox bitmap and lastly the second line. We have two bitmaps for the two states of the checkbox, based on the state of the checkbox we paint the appropriate bitmap. checkbox, notify the listener and invalidate the view. We return true when no more processing of the event is needed and false otherwise. onItemClick is called handle single click and when onItemToggle is called maintain our of map of selected items. Out of the box adapter implementations cannot handle a custom view, so finally we implement a custom adapter.